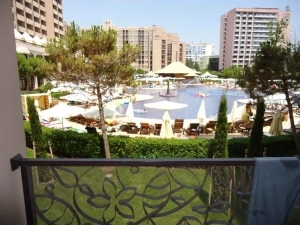 Luxury apartment for sale located in the Barceló Royal Beach complex – Sunny beach –Bulgaria – only 50 m from the beach. Sunny Beach resort complex is situated in a sheltered bay facing East. The beaches, longer than eight kilometers and 150metres wide are covered with fine sand and natural sand dunes. The Black Sea water is clean and calm without high tides and the bottom of the sea is sand covered. The Barcelу Royal Beach complex is a five stars luxury hotel, situated in the heart of the Sunny Beach resort. It is next to the Black Sea in Bulgaria and just a few metres from the beach. Airport "Sarafovo" (Bourgas) is located 30 km from Sunny Beach and the airport in the city of Varna is 90 km away. This spacious and modern resort has a wonderful set of both indoor and outdoor pools. It boasts a 1,200 mІ professional Spa centre, a children’s club, stunning gardens, a shopping centre with 99 stores and protected underground parking. Facilities and services: The complex offers secure indoor parking with 140 places, a currency exchange, hairdresser, beauty salon, doctor, room service, laundry, ironing, dry cleaning, internet room, photocopying, fax, to pay by credit card, luggage elevator, a gym, 3 swimming pools, indoor pool, 2 saunas, tennis court, 3 Jacuzzis, 2 solarium, Turkish bath, massage. The apartment for sale extends to 51 sq. m of living area. It is spacious and consists of a bedroom, living room with a kitchen, a bathroom and terrace. The apartment is luxury furnished suitable for living.